At times, we can find ourselves clouded with false information that appears out of this world. Is social media and marketing dead? or losing its impact? We are here to save you with the truth! Fact not myth: the amount of social media users is expected to increase to 2.95 billion by 2020 according to Statista. Therefore, business branding through social media is crucial to reach a vast audience you cannot reach elsewhere. 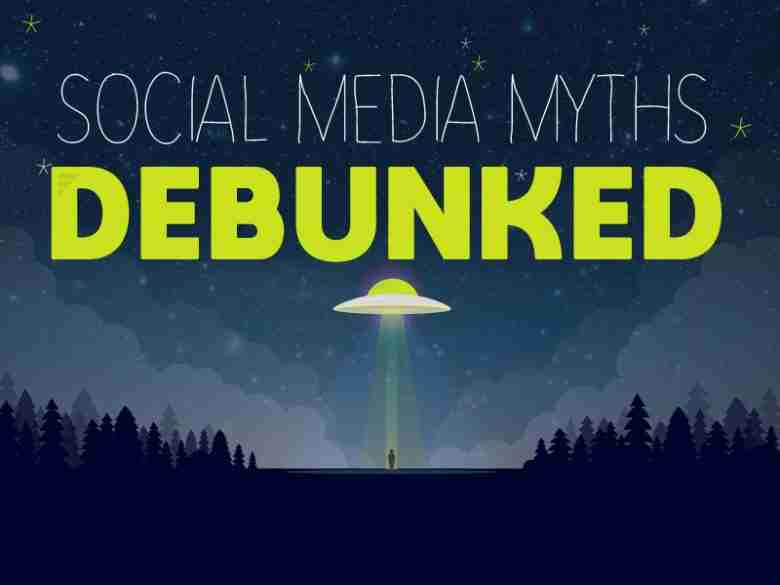 Read on to discover our rebuttals to the top five deceptive social media myths out there today. Yes, word-of-mouth is a traditional form of marketing that is very effective for many businesses, but choosing to only utilize that strategy can hinder overall business. As of last year, approximately 77% of United States Americans had a social media profile. The lack of an online presence means your business is missing out on a huge customer base by limiting its audience reach. Plus, excluding your business from digital marketing can prevent opportunities to increase brand awareness, boost online traffic, and acquire new customers. A great strategy to remain relevant and successful on social media is to engage with your customers and followers online. If you are not seeing any conversions on mobile, it is time to discover the reasons why. One thing to check is if your website is mobile-friendly. It should be responsive to both mobile and desktop. The mobile experience should be easier, faster, and should not stress the online user. Keep in mind: websites that do not properly load on mobile devices will cause visitors to leave your site and will most likely never want to return. Contact Bigfin if your website needs to be optimized for mobile. While social media is a great way to reach new customers, most online engagement will be with current customers. In fact, 84% of fans of company Facebook pages are existing customers, according to research by DDB Worldwide and Opinionway Research. Therefore, recognize social media as more of a loyalty program versus a customer-acquisition platform. Utilize social media profiles (such as Facebook) as a means to keep in touch with your loyal customers. Reward them with special offers, event exclusives, or the chance to be the first to learn about new products and/or services. Blogging can be misconstrued as unimportant, while often overlooked as a non-business asset. Through the years, blogging has become recognized as a beneficial and smart lead generation tool. A company’s blog is essentially content marketing and can be used to promote the business itself or provide insight on prices, products, the industry, and more. Make sure to have a clear and concise schedule and strategize content that will help boost traffic and interest. After all, blogging is another way to engage with customers and identify your brand as trustworthy. Negative reviews are inevitable—after all, mistakes and misunderstandings can happen. Instead of stressing about it, act upon it. Show your customers you care about their feedback by responding. Use this opportunity to fix what was wrong and try to win them back. By doing so, the reviewer may improve their rating or edit their feedback to praise the company. Plus, responding to negative reviews lets customers know your business is dedicated and trustworthy. Overall, the benefits and value of digital marketing is not a myth. It is an amazing, yet powerful tool to grow and establish a business even further online. A business will find success by remaining consistent, utilizing all the marketing opportunities to reach their target audience, and care about their current and prospective customers. Need Social Media Help? Contact Bigfin Today! Bigfin.com is an industry leader in online advertising, mobile advertising, SEO and custom web design. Our comprehensive digital marketing solutions include social media management as well as content creation and management. Looking for original website content or help with search engine optimization? Contact us online or by phone at (425) 822-8200.